"What a great idea...this gives the individual the opportunity to feel that they can make a difference. 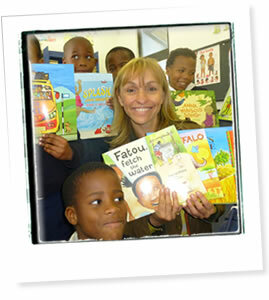 And the great thing about books is they go on journeys...for whoever is going to read that book"
Please visit our current partners' websites to find out more information on the incredible work these charities do in raising the standards of education and literacy in Africa. We would also like to extend personal thanks and gratitude to Nick Johnson, Rob Thain at Un-Titled, Stephen Scott at SAS Squad, Carolin and David Sommer at David Sommer Consulting, Julie Begenough and Pam Martin, Ruth Wells, Joseph O'Reilly, Tom Smith and Lesley Pinder at Book Aid for their feedback, support and guidance in making this scheme possible.